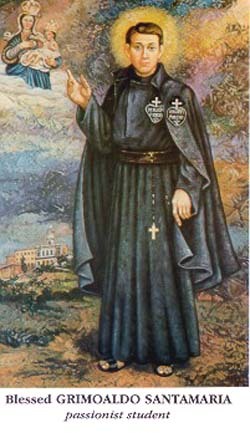 Purification of the Blessed Grimoaldo (born Ferdinand Santamaria) was born in Pontecorvo (FR) on 4 May 1883, he entered the novitiate of the Passionist in Paliano (FR) February 16, 1899, where he made a profession of temporary vows March 6, 1900 and died prematurely for acute meningitis in the Passionist monastery in Cecco (FR) on 18 November 1902. John Paul II declared him “venerable” on 14 May 1991 and “blessed” January 29, 1995. The remains of Blessed Grimoaldo are venerated in the church of Passionist Abbey Ceccano. Roman Martyrology: At Ceccano at Frosinone, blessed Grimoaldo of Purification (Ferdinand) Santamaria, religious of the Congregation of the Passion, which, as he prepared with fervor and joy in the priesthood, died piously affected by a disease. The name of blessed Grimoaldo, seems to draw more austere and grim figure of an old hermit in the desert rather than to a sympathetic young man. But this is just the name that the person directly involved chose becoming passion, while at the baptism was called Ferdinand. The eldest of five children, he was born in Pontecorco in the province of Frosinone, May 4, 1883 to Peter Paul Santamaria Ruscio, Cecilia, a fervent Christian, turned raw hemp workers into ropes of various sizesby hand and then sold the rope markets in neighboring countries. He was baptized and confirmed the next day at five months. Little Ferdinand, helped also by the example of very good father and mother, grew up healthy and good. In 1890 he started elementary school. He received his first communion at just eight, beomg particularly good in the eyes of the priest, which distinguished him from his peers. The church was his favorite place; he regularly attended and greatly loved Mass. He served as an altar boy with care and emotional participation. He could not keep from crying when he was unable to go to church because he had to work. When he was in church nothing could distract him. Kneeling before the statue of the Immaculate Conception, he seemed a little statue, motionless with folded hands, come what may. The old sexton had tears in his eyes and looked at him spellbound. The pastor’s heart grew thinking about the future of that boy. It’s true that he was dreaming of a pope, and hisfather, at all costs wanted a ropemaker, but Don Vincenzo Romano realized that his vocation was another: Ferdinand was always in church as attracted to a magnet, had a passion to serve the Mass was always present in the parish choir to sing with his beautiful voice, remaining long in a silent and rapt contemplation. The priest then was not surprised at all when one day someoe etold him that he saw Ferdinand, the son of the ropemaker, in a trance before the image of the Madonna. The Passionists at the nearby shrine of Our Lady of Grace lead an austere life; he visited it with ever greater frequency, it seemed made for him. He talked openly in his family, but his father pushed him toward the profession of ropemaker. Ferdinand, being the eldest, had to continue the work of his ancestors. So his father tried to dissuade him, even with severe punishments, from what he thought was just the whim of a teenager. Even the most stringent punishment was in vain so his father bought him a horse and a wagon, sending him to fairs and markets to sell rope, hoping the idea of making money would remove the convent from his head. The proposal was very flattering, but Ferdinand pointed to the river and said to his father: “Life flows like water … Our days go by fast … then what?” Began to wobble as the beliefs of his father, but he failed to surrender completely. One evening the boy came home from a function, he found the door already closed and was forced to sleep at a neighbor’s house. Looking back on such severity, his father felt a lump in his throat and he wanted to cry. He finally began to understand what his wife had long since guessed, contemplating his son, as a priest and missionary. The boy was now sixteen, and knew what he wanted. He had done well in the advanced study of Latin, grammar and rhetoric, more than ever determined to follow his path. His teacher was Don Antonio Rosca, a young man who had attempted the life of the monastery but was forced by illness to return home, while retaining admiration and sympathy for the Passionists. Ferdinand also studied at night by candlelight, recovering in a few months almost three years of study. Overcame the inevitable and facilotte ironies of comrades who did not understand his strange decision. Even his father finally gave in, trusting to his wife Cecilia, “Our boy has no interest in making rope, his interest is only inr the church.” His father brought him right to the station of Aquino to give a final blessing and the last kiss. Ferdinand became more cheerful and outgoing, irrepressible joy now appeared on his face. Testified one of his best friends: “Meeting him and seeing him turned around, I asked him what was wrong and he told me that wanted to become a Passionist.” He left with happy face “, warning skeptics on duty:” I’m leaving and not come back “and leaving behind the memory copy of a quiet guy, modest and irreproachable. Only once in the house was disobedient: invited to go and call my father at the inn, did not go to hear him swear, and fearing it would hurt my heart. On February 15, 1899 Ferdinand arrives at Paliano, in the province of Frosinone, to begin a year of novitiate. On 5 March donned the religious habit and took the name of Grimoaldo as a devotion to the patron saint of his native country. The life of a novice, all loneliness, prayer and mortification seemed just sewn to fit him a joy so real and intense he had never experienced before. The older brothers, and his companions, they noticed in him a constant effort towards perfection. Issued religious profession, he moved to Grimoaldo Ceccano, always in the province of Frosinone, where he took up studies classics. He would then study philosophy and theology to prepare for the priesthood. Commitment to the sanctity added that no less for the study. With candor and sincerity he relied on the guidance of his spiritual director. Stubbornly bent on books, eager to prepare himself to be a worthy priest of Christ. He gratefully accepted the help that some brothers gave him at school, given the gaps in his education received in Pontecorvo, and was even singled out by teachers as a model for his companions. Grimoaldo lived “always cheerful, even in humiliation, in opposition, the difficulties of the studies. Despite the students had very little contact with the outside world and lived virtually unknown to people, the reputation of Grimoaldo crossed the fence of the house of religion: even the people who lived around the convent because they noticed his goodness and recommended to the trust and not in vain his prayer. His parents who visited him with his sister Vincenzina, the young son showed all his religious vocation and joy for all his gratitude for his education in the family. The boy was a “colossus of health”: sturdy, well proportioned, tall enough. No one would ever suspect what was about to happen. October 31, 1902, during an afternoon walk around the monastery, Grimoaldo felt a sudden stabbing pain in his head, accompanied by dizziness and hallucinations. He returned and went back to bed. The following day, the feast of All Saints, he participated in the Mass and took communion devoutly. But the illness persisted, he went back to bed and the doctor was called. The diagnosis was cruel and swept away all hope, acute meningitis, which would have added complications. In the days of the disease even more Grimoaldo revealed his desire for holiness and his room was transformed into a sort of school of virtue. The sick fact shined in the patience he has always admired and often repeated the test to accept the disease of the will of God and recommends to his companions to help him with prayers not to lose patience and courage in embracing cross . With a joy that shone on his face, he declared himself happy to do the will of God. In the last moments of life his face was shining like the sun, his eyes were fixed on a point of the room. He died at sunset calm, serene and quiet, like a child gently resting in the arms of his mother. It was November 18, 1902 and Grimoaldo was just nineteen and a half. The religious Facer mind “in the belief that you lose a brother and you buy a saint.” Parents, not present at his death, appeared Grimoaldo consolation for the loss of our dear son. So live peaceful, happy to have had a son like that, and look to him begging him in their needs. His mortal remains were interred in the cemetery of the village, but in October 1962 were exhumed and translated to the church of the convent of the Passionist Ceccano. After sixty years well into the pocket of his funeral dress, now reduced to shreds, was found a small pieces of fabric together with a note that read: “Gabriel of the venerable dress, a relic that young he always carried with him. Grimoaldo during his life he had looked with particular affection in San Gabriel, partaking of his example. He wrote of him: “This angel was a perfect imitation of our venerable Gabriel, tender devotion to the Virgin of exquisite purity of intention, of continuous and intimate stretch with God docile and manageable, like wax in the hands of superiors.” As was the case forty years ago for Gabriel, even Grimoaldo praised “this demonstration is cautious and wary of making great account of the little things that has placed the sanctity of religious find that his delight in being in front of Jesus in the Blessed Sacrament where sometimes passed for hours, this show such fervor in the recitation of the divine praises. His reputation for holiness spread enormously, because many were attributed to his intercession and, finally, Pope John Paul II declared him “venerable” on 14 May 1991 and “blessed” January 29, 1995. This entry was posted on Wednesday, November 18th, 2009 at 1:05 am and is filed under Passionist, Year for Priests. You can follow any responses to this entry through the RSS 2.0 feed. You can leave a response, or trackback from your own site.